Since 2015, Vigo has set out to put an end to ugliness with an urban art festival that brings colour to its streets. Vigo: cidade de cor’ is a project which seeks to turn the city into a street museum where you can find different artistic registers within the urban environment. In addition to helping to change the appearance of the spaces most affected by abandonment or the passage of time, the initiative also promotes and manages cultural activities to increase citizen participation in the aesthetic change of the olive city. It all began in O Príncipe street with the reproduction of Urbano Lugrís’ oil painting -Fiestra- by the Basque artist Luis Olaso. Since then, the so-called party walls of Vigo have already become one of the main attractions for street art lovers. Although you can see all the work done so far on its official website, nothing compares to the feeling of coming across an exhibition of art of this magnitude ‘face-to-face’. Thanks to the good reception of the initiative by the residents, more and more works are flooding the empty spaces of the city. A total of 42 works make up this particular museum. Nano, Federico Draw, Ramón Trigo, Pilar Alonso, Nelson Villalobos, Peri, POW and others, are the more than 44 artists in charge of beautifying the streets of Vigo. In addition, other options offered by its website are: find all the information about the creators and works that make up this initiative, locate the location of the ones you like best and even know the bus lines and stops that take you to them. 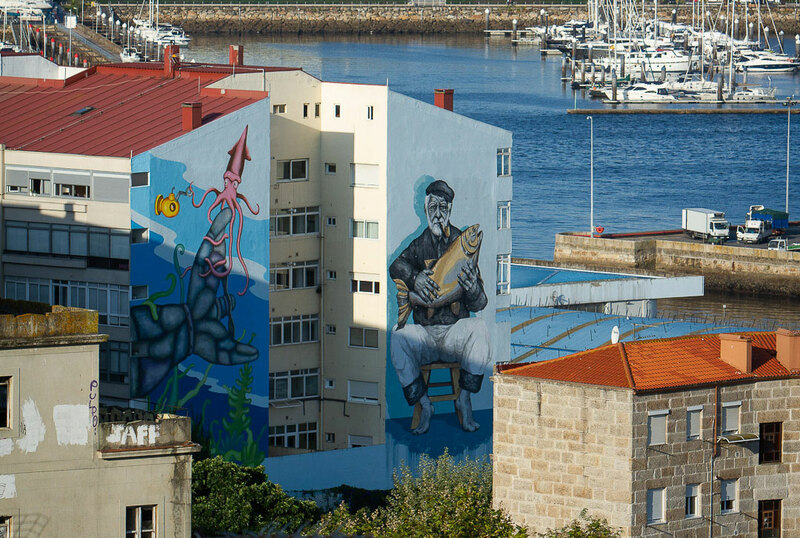 Medianeras, facades, walls and walls are the blank canvas for the artists – Galician, from the rest of Spain or from other countries – who express their creativity, almost always in a XXL format. None of the murals have anything to do with each other. In fact, there is no single connecting thread that encompasses all the works in a particular theme or style. Each artist develops his or her own art by capturing his or her own interpretation in each performance. Therefore, the experience is completely different if we find ourselves in front of the mural ‘Sea Walls for Oceans’ (up) -in Rúa Torrecedeira nº4- of the Portuguese Federico Draw in which the sustainability of our oceans is promoted than if we admire the work of the Plaza de España carried out by the cooperative Cestola na Cachola (down), organization that is characterized by its fight against individualism promoting the union of society and networking. The truth is, it doesn’t matter if one mural is bigger or has more color than another. What is really interesting in this artistic project is to put an end to those grey and old-fashioned spaces by means of a formula that allows us to improve the city and put talent on the street. This edition, the city’s open-air museum, has selected 15 proposals to continue ‘decorating’ the party walls and walls throughout the city. After three editions of the festival, the creators selected for this occasion stand out for having been born or worked outside Spain – hence the international character expected for this new selection of works. 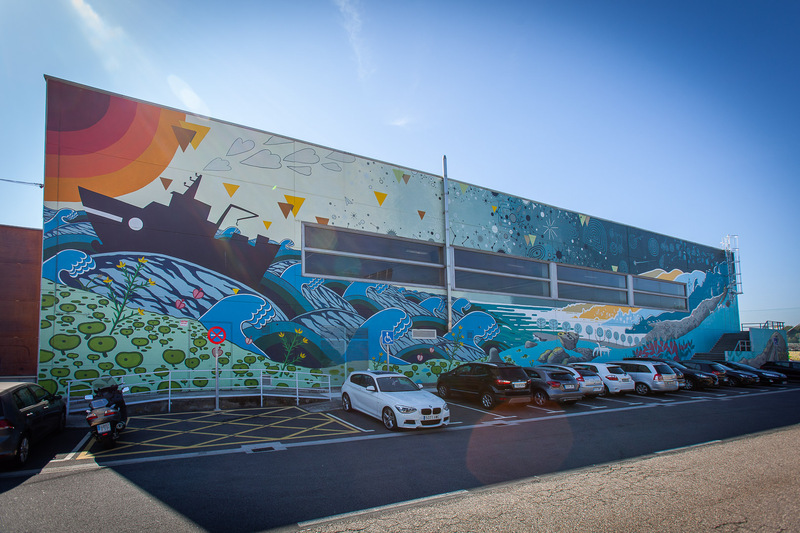 Illustrator Iria Fafán, Isaac Mahow, Julieta XLF and Louis Lambert are some of the creators selected to decorate this museum of giant murals. Do not miss any step of the project and follow the official account of Instagram, you can learn more about the creative process of the works you like the most. Thanks to this initiative, Vigo offers us the chance to get to know every corner of its city centre and surroundings. An original and creative route that offers us a much more colourful view of the city. ← What to do in Galicia from 1 to 7 October?